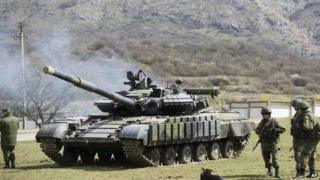 Analysis: Could Russia absorb eastern Ukraine? Nato military spokesmen are tight-lipped. Nobody wants to spell out the details of Russian military deployments on the eastern frontier of Ukraine. But on one thing they are all clear. According to unattributed US sources, Russia has massed up to 30,000 troops on Ukraine's eastern frontier - and the key thing is they are arrayed and equipped to go on to the offensive at very short notice. Moscow is ready to implement a further military option in Ukraine, if and when President Vladimir Putin gives the green light. Western military planners deal with capabilities, not so much intentions. The message from Nato then is that the Russian capability is there and ready. What is in Mr Putin's mind is impossible to determine. Many believe that the move into the Crimea was taken at short notice in response to circumstances, rather than it being part of a long-term plan. Events on the ground, signals from the West, the extent of economic pressure (or lack of it), as well as Russia's basic assessment of its own strategic interests will all determine Moscow's next move. US President Barack Obama has warned Russia to stop "intimidating" Ukraine and reduce troop numbers. For all the determination of the new Ukrainian government to resist any Russian military pressure the odds - at least in terms of any large-scale Russian movement - are stacked heavily against Kiev. Russian forces are reportedly concentrating to face south-eastern Ukraine and Nato clearly fears a major punch westwards towards the city of Donetsk that potentially could seek to sever the southern quarter of the country. Nato's Supreme Allied Commander, Gen Philip Breedlove, has warned that Russian troops could advance all the way across Ukraine to link up with Russia's forces in the breakaway Moldovan enclave of Trans-Dniester. Western assessments are that the military units that Russia has in the field are capable of mounting this kind of operation. Details of Russian deployments may be sketchy, but Nato planners will clearly be looking at the nature of the units deployed, their dispositions in the field, the extent to which logistical support equipment is in place to move forward supplies, and so on. Social media sites have shown Russian tank units moving up on trains and assault helicopter units being deployed in the field. However, as so often with this type of material, one must be cautious when confirming that it is actually taken at the time and locations shown. While the invasion of Georgia in 2008 showed up some significant shortcomings in Russia's land forces, they are more than a match for Ukraine's cash-starved military. If this degenerated into serious fighting Russia should quickly be able to seize control of the air. It can dominate the Black Sea and potentially could mount amphibious operations on the Ukrainian coast. That is the potential military playbook. But what is Mr Putin really up to? Clearly a largely bloodless advance into Ukraine may have its attractions. But the other possibility - of Ukrainians and Russians shedding each others' blood - is much less palatable to the Kremlin. A major incursion could also prompt some kind of counter-Russian insurgency with the possibility of hardening linguistic and national divisions. The real strategic question for Russia is the fate of Ukraine. Will it be a buffer between Russia and the West in both physical and political terms or will it drift into the European Union and Nato camp? The latter is unacceptable for Mr Putin. Presidential elections are due in Ukraine in May with all sorts of uncertainties about the country's future constitutional arrangements. Russia has two ways in which to influence the political process. It can seek to subvert and undermine from within. Western diplomats believe that Russia has sent significant numbers of people over the border into eastern Ukraine where pro-Russian demonstrations have been "turned on and off" seemingly at will. It also has the looming threat of military intervention. Indeed because its troops are close to their regular training grounds they can probably be kept at a high-level of alert for a significant time. All of this, in Mr Putin's view, should concentrate minds in Kiev nicely.